The Malta FA have concluded talks with Bank of Valletta to renew the sponsorship deal for the national football leagues for another three years. This was announced at a news conference yesterday during which the draws for the 2015/16 Division One, Two and Three championships were made. Bjorn Vassallo, the Malta FA general secretary, expressed his delight and appreciation at BOV’s on-going backing of the league competitions and the annual Super Cup clash, this year being contested by Hibernians, the 2014/15 champions, and FA Trophy winners Birkirkara, on August 12. The Nike Ordem 3 ball. Looking back on last season, Vassallo revealed that attendances were down by over one per cent compared to the previous year but the overall total is still better than two seasons ago. Vassallo attributed the slight drop to the dearth of interest in the title race after Hibernians walked away with the championship, securing the Premier League crown with three games to spare. “On the other hand, the second division championship, FA Trophy competition and Super Cup have lured more fans to our stadia than the previous campaign,” Vassallo told reporters at the Grand Hotel Excelsior. More than 170,000 spectators watched games from MFA competitions last season but that figure exceeds the 200,000 mark when the attendances for international games are added to the equation. 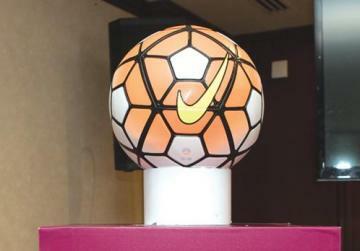 Vassallo said these statistics show that football remains the most-followed sport on the Maltese islands. While the focus yesterday was on the minor divisions, the coaches and players of the 12 BOV Premier League clubs will have been thrilled to learn that, starting from this season, the Malta FA will be providing new, high-quality balls to be used in top-flight games. The colourful Nike Ordem 3 was yesterday unveiled as the match ball for the 2015/16 BOV Premier League, a move that will surely be greeted with nods of approval after several players and coaches bemoaned the quality of the balls used last season. Nike Ordem 3 balls will also be used for the upcoming English Premier League, La Liga and Serie A season. The balls for the remaining divisions will be supplied by Macron. The MFA general secretary said that the championships in all four divisions will wrap up by the end of April 2016 as extensive works are to be carried out on the pitches of the Nationl Stadium and Centenary Stadium next summer. In his address, Vassallo also praised the sterling work and achievements of the association’s refereeing department, headed by Adrian D. Casha. Last season, Maltese match officials took in 56 international games (football, futsal and beach soccer) besides being involved in 18 exchange programmes with a number of countries, including Northern Ireland, Republic of Ireland, Norway, Czech Republic, Andorra, San Marino, Luxembourg, Wales, Latvia and Georgia. Another first was recorded in September when the BOV Women’s Super Cup final between Hibernians and Birkirkara was controlled by a female referee from San Marino. Referee Clayton Pisani was promoted to UEFA category one, the first Maltese to be awarded this status in 20 years, Alan Mario Sant moved up to UEFA category two and Jude Amin Utulu established himself as one of the top FIFA beach soccer referees. As part of their preparations for the 2015/16 season, the FIFA elite and elite development referees within the Malta FA will undergo a summer training camp in Lindabrunn, Austria between August 31 and September 4. 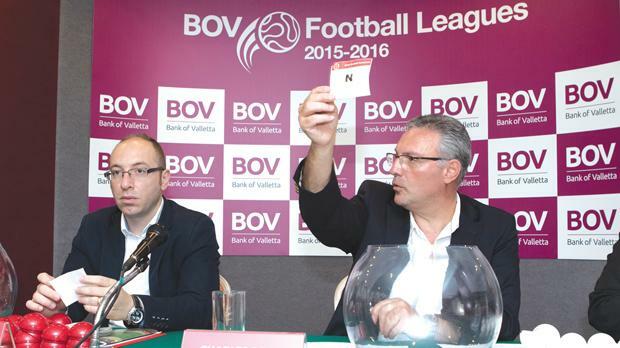 The highlight of yesterday’s news conference were the draws of the first, second and third division championships for the upcoming season as the 2015/16 BOV Premier League fixtures had been drawn during the Malta FA Awards late last month. The draws were conducted by Vassallo and Charles Borg, chief executive officer at BOV, under the watchful eyes of Rodney Pisani, the MFA’s deputy general secretary who runs the association’s competitions depart-ment. In Division One, which kicks off on September 11 and ends on April 24, two teams will be promoted to the Premier League and the third-placed side will face the third-from-bottom team in the top division in a relegat-ion/promotion play-off. The last-placed three teams will lose their Division One status. The second division league gets under way on September 18 and concludes on April 23. In this category, the top three teams will go up to Division One and the bottom three teams will be relegated. Confirmation of Marsaxlokk’s participation means that the Division Three championship will again comprise 13 clubs. The top three teams in the final classification will earn promotion while the bottom two would need to re-apply to participate the following season. The 2015/16 Division Three league runs from September 19 to April 24. BOV Division One: Fgura United vs Ħamrun Spartans; Rabat Ajax vs St George’s; San Ġwann vs Żebbuġ Rangers; Gżira United vs Lija Athletic; Vittoriosa Stars vs Pietà Hotspurs; Senglea Athletic vs Mqabba; Gudja United vs Melita. BOV Division Two: Sirens vs Siġġiewi; Mġarr United vs Birżebbuġa St Peter’s; Kirkop United vs Qrendi; Żurrieq vs Żabbar St Patrick; Msida St Joseph vs Mellieħa; Żejtun Corinthians vs Marsa; Għargħur vs Swieqi United. BOV Division Three: Kalkara vs Xgħajra Tornadoes; Attard vs Dingli Swallows; Sta Luċija vs Sta Venera Lightnings; Marsaskala vs Mtarfa; Ta’ Xbiex vs Luqa St Andrews; Mdina Knights vs Marsaxlokk (Għaxaq bye).